HomeSouth AmericaBrazilRio de JaneiroMartha VasconcellosNiteroi by Ferry Boat... a picturesque experience! Here is another itinerary for the walking tour along the beauties and tourist attractions of Rio de Janeiro. Across the Guanabara Bay we will find the famous city of Niteroi. Due to its rich history, Niteroi was nicknamed in various ways – Nicki City, Niquiti and the Smile City. 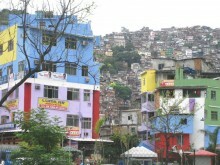 It is worth noting that this city is considered to be the richest in Brazil. The nick-name –the Smile City – is by no means fortuitous. There are plenty of reasons to smile in Niteroi. You will find there numerous astonishing beaches, where it is such a delight to take sun bathes, enjoy the freshness of the ocean breeze and just rest from all the fuss of the working days. Such pastime would definitely make you smile in the most enjoyable way. We usually begin our guided tours in Rio de Janeiro with the ferry boat trip. This way you will be able to take a look at the entrance of Guanabara Bay, after which Rio de Janeiro was named (from Portuguese it could be translated as the “River of January”). Besides that we will have an opportunity to visit the Contemporary Art Museum, which is truly a masterpiece of the well-known architect Oscar Niemeyer. The service of a private guide in Brazil is aimed at helping the tourists in the foreign country. The next stop is a little fisherman village, where you will take a look at the way fishermen live and work in Brazil.